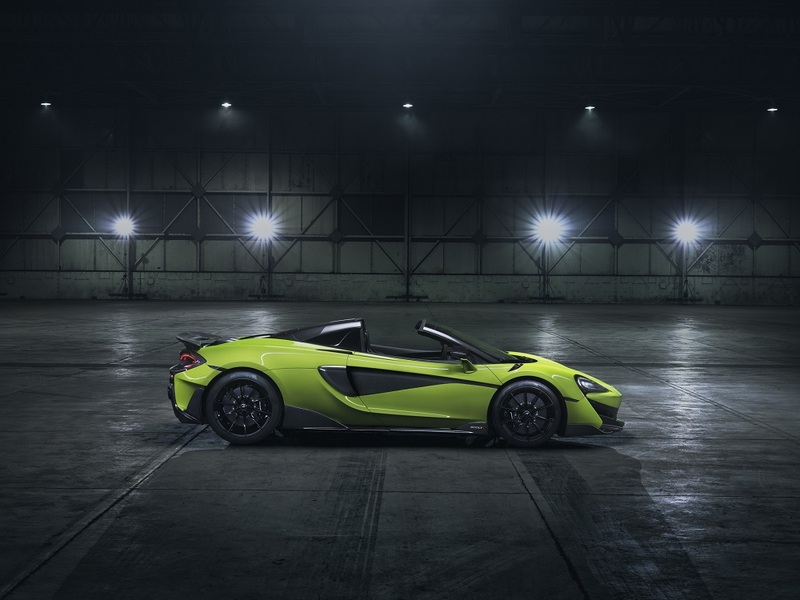 McLaren has released first images and details of the third new model in its £1.2 billion Track25 business plan - the McLaren 600LT Spider. The fifth car to carry the Longtail name, the new convertible fully embodies the McLaren Longtail philosophy of increased power, reduced weight, optimised aerodynamics, track-focused dynamics and limited availability. In addition, it brings a new dimension of excitement over the 600LT Coupe, without compromise to the dynamic purity of the most performance-focused car in the Sports Series lineup: a retractable hardtop to give the choice of open-air driving. 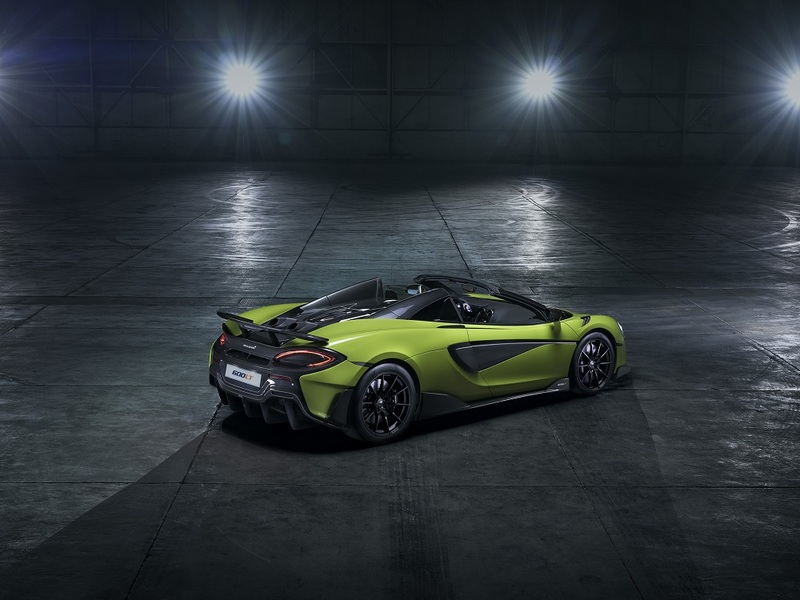 Like its 600LT Coupe sibling, the Spider records a significant weight saving over the model on which it is based, with McLaren’s engineers achieving a reduction of 100 kg at DIN weight over the 570S Spider. 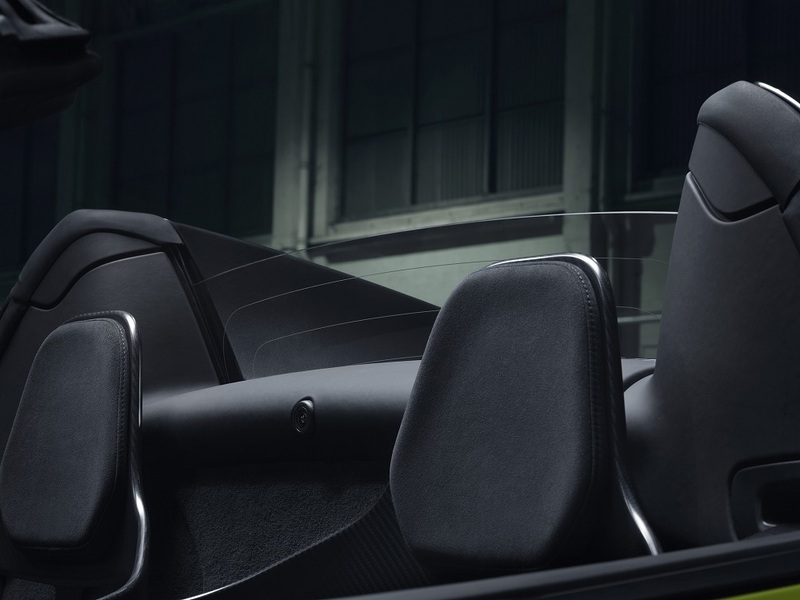 Furthermore, thanks to its lightweight but incredibly strong carbon fibre MonoCell II chassis, the 600LT Spider retains the structural rigidity of the Coupe with none of the strengthening that is usually required with conventional steel or aluminium structures. The result is a weight penalty of only 50 kg over the Coupe, which contributes to a lightest dry weight of just 1,297 kg for the Spider. This is at least 80 kg less than any direct competitor and the equivalent power-to-weight ratio of 463 hp-per-tonne underpins astonishing levels of performance and dynamic prowess. Enhancing the Sports Series Longtail experience with open-air motoring is as easy as pushing a button to lower or raise the three-piece, powered retractable hardtop roof at speeds of up to 40 km/h (25mph). 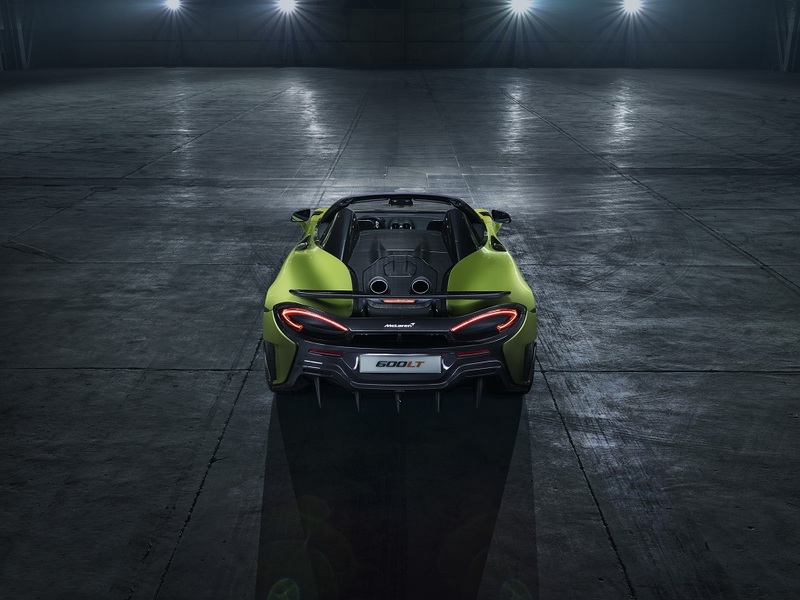 With the roof lowered, occupants benefit not only from wind in their hair, but also the memorable aural and visual drama provided by the top-exit exhausts that are unique to the 600LT. An electrically-operated, glazed wind deflector can be activated independently of the hardtop, to reduce buffeting or increase ventilation - or simply to allow more of the exhaust sound into the cabin. Incorporating technology proven in the 650S, 675LT and 570S Spiders, the hardtop roof is more secure and wear-resistant than a fabric alternative would be, as well as offering Coupe-like cabin refinement when in the raised position. Equally importantly, it allowed McLaren’s design team to maintain the focused design language and silhouette of the 600LT Coupe. When lowered, the roof stows elegantly with the assistance of soft-close technology beneath a tonneau cover located behind the seats; with the roof raised, this tonneau storage area provides an additional 52 litres of luggage space. The 600LT Spider benefits from the same portfolio of performance enhancements that has proved irresistible to 600LT Coupe buyers. The electronic control systems of the twin-turbocharged, 3.8-litre V8 engine have been revised, the cooling system uprated and the shorter exhausts tuned to liberate more power. The engine produces the same 592 hp and 620 Nm in the Spider as it does in the Coupe. 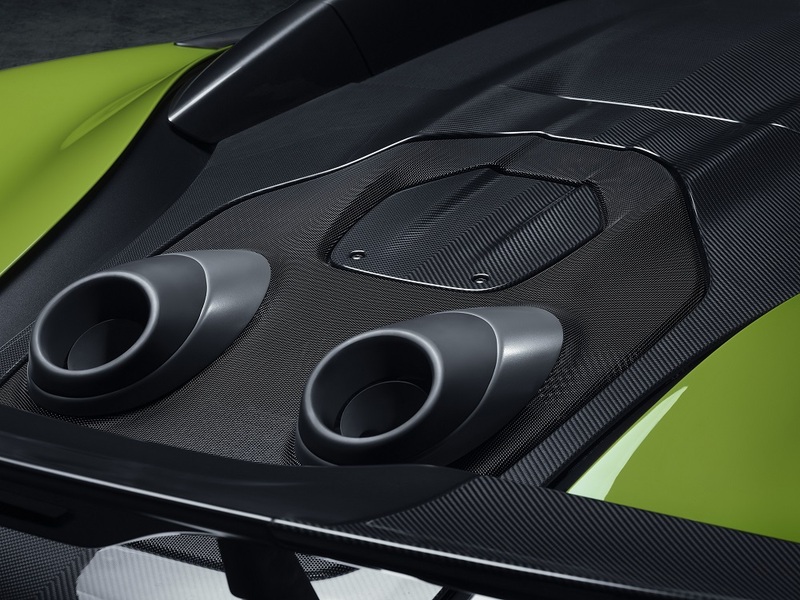 The uprated powertrain enables the driver to exploit the 600LT Spider’s carbon fibre monocoque chassis to the full, aided by a dual-clutch, Seamless Shift seven-speed Gearbox (SSG) that features Ignition Cut in Sport mode to facilitate faster changes whilst delivering a dramatic aural crack from the top-exit exhausts, plus Inertia Push in Track mode to optimise acceleration. The 600LT Spider will reach 100 km/h (62 mph) from a standstill in 2.9 seconds, with 200 km/h (124 mph) achieved in just 8.4 seconds - a near-indistinguishable 0.2 seconds slower than the Coupe. The maximum speed is 324 km/h (201 mph) with the roof raised, or 315 km/h (196 mph) with it lowered. 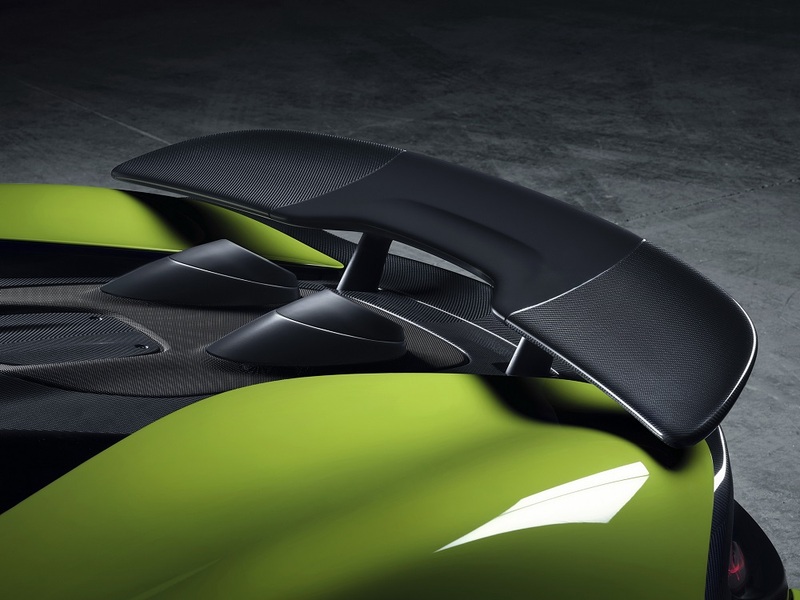 Performance is further enhanced by the lightweight carbon fibre bodywork that creates the Longtail silhouette and the same design of fixed rear wing as the Coupe which - despite the aerodynamic challenges posed by a convertible body - generates the same 100 kg of downforce at 250 km/h (155 mph). Ultra-precise, track-focused handling is supported by a forged aluminium double-wishbone suspension system with recalibrated dampers, firmer engine mounts and a lightweight braking system. The 600LT Spider is fitted with bespoke, track-focused Pirelli P- Zero Trofeo R tyres and the driving experience is further enhanced with quicker steering and sharpened responses from throttle and brake pedals. 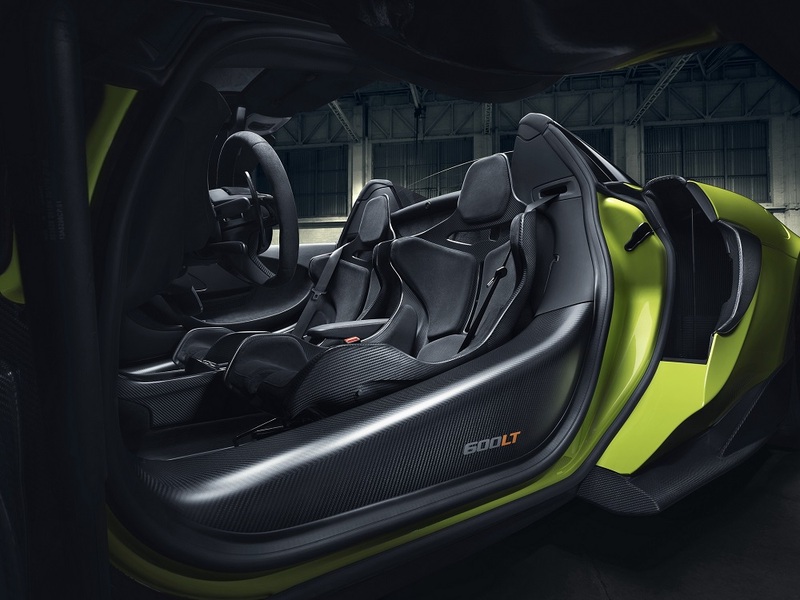 Lowering the roof of the 600LT Spider showcases the performance-orientated interior, which features lightweight Alcantara trim and Carbon Fibre Racing Seats from the McLaren P1 as standard. 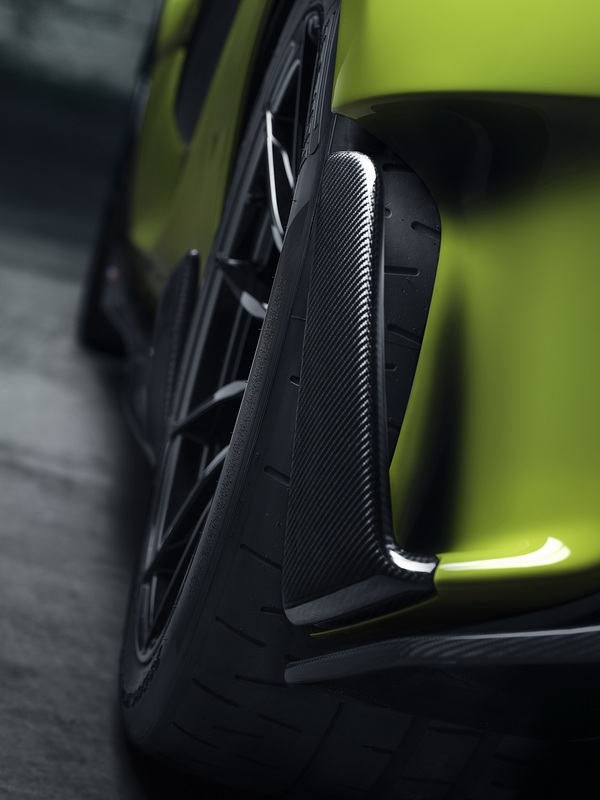 The Super-Lightweight Carbon Fibre Racing Seats designed for the McLaren Senna are available as an option, either on their own or within the MSO Clubsport Pack. Further weight-saving options and measures - including deletion of the audio and climate control systems - are available to buyers determined to shave off every kilogramme possible. 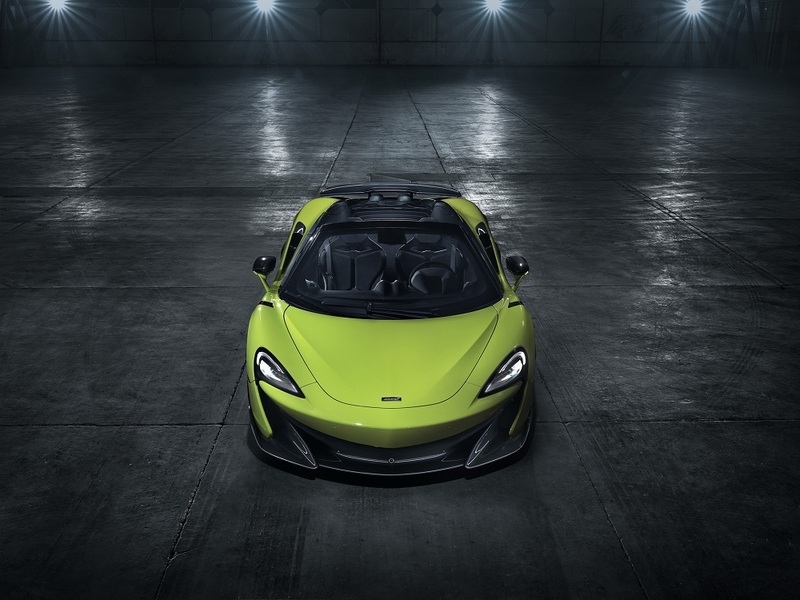 The new 600LT Spider is the fifth model to carry the coveted LT badge, joining the illustrious bloodline that began in 1997 with the McLaren F1 GTR "Longtail", of which only a development prototype and nine examples were built. Victorious in five of the 11 rounds of the 1997 FIA GT Championship, the original Longtail also finished first and second in the GT1 class at Le Mans, almost 30 laps ahead of the opposition. 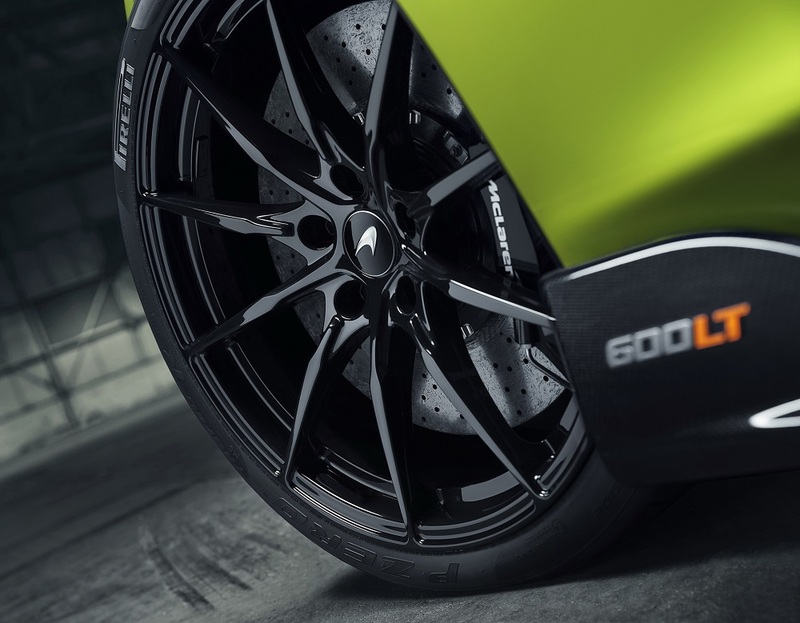 McLaren revived the legendary Longtail name at the 2015 Geneva International Motor Show, with the launch of the 675LT Coupe, a limited-volume model that rapidly sold out. In response to customer demand, a 675LT Spider followed, all 500 examples of which were sold within two weeks. The fourth model to bear the Longtail name, the 600LT Coupe, was revealed in July 2018 at the Goodwood Festival of Speed and has since been hailed by critics as one of the finest cars in its class - an accolade that will now be challenged by its new Spider sibling. Like the Coupe, availability of the 600LT Spider will be limited, with build slots scheduled around other Sports and Super Series models. Available to order now from McLaren retailers, each car will be hand-assembled at the McLaren Production Centre in Woking, Surrey, England. 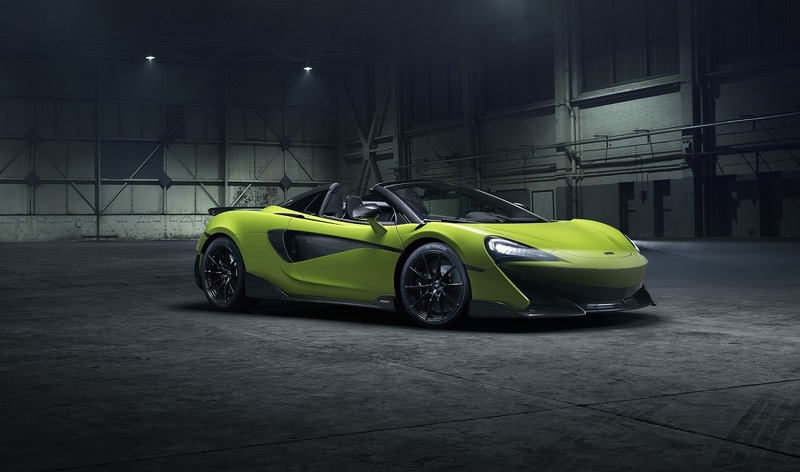 The McLaren 600LT Spider is priced from £201,500 with taxes (UK).